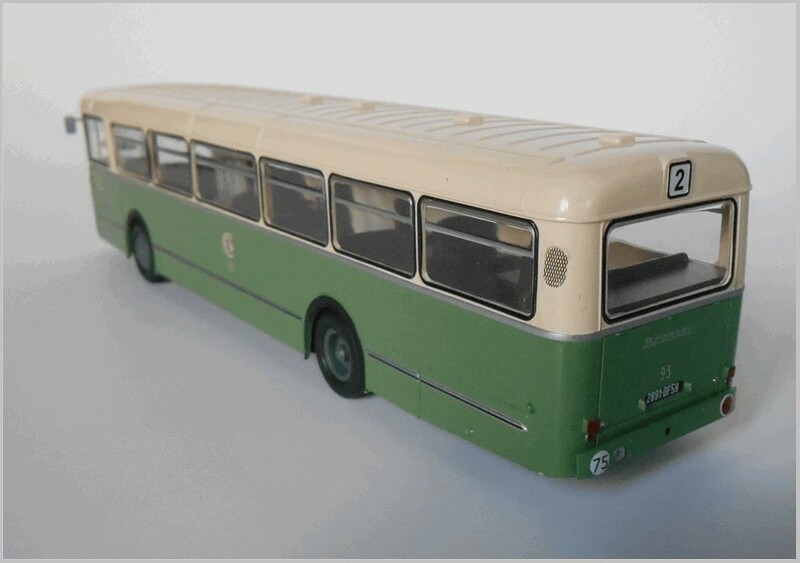 This time we’ll look at another scarce Belgian bus (almost unknown outside France and Belgium), a recycled German giant (up to the Second World War it was one of the largest buses ever produced) and an innovative French one, alas a missed bestseller. 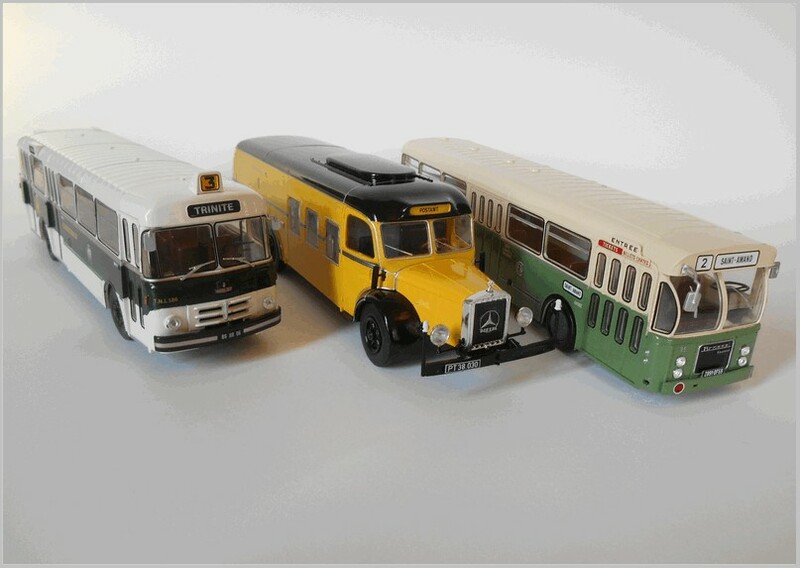 All of them are from the Italian Hachette partwork “Autobus dal mondo”, a collection of eighty 1:43 bus models, very similar to the French one “Autobus et autocars du monde”. The models are produced in Bangladesh for Ixo. No. 67 (no. 90 in the French collection) Brossel BL55 1966 – With the 1962 Brossel A92 DARL (see part twelve, no. 36) we have already seen a short review of the Belgian automotive industry and the Brossel history. 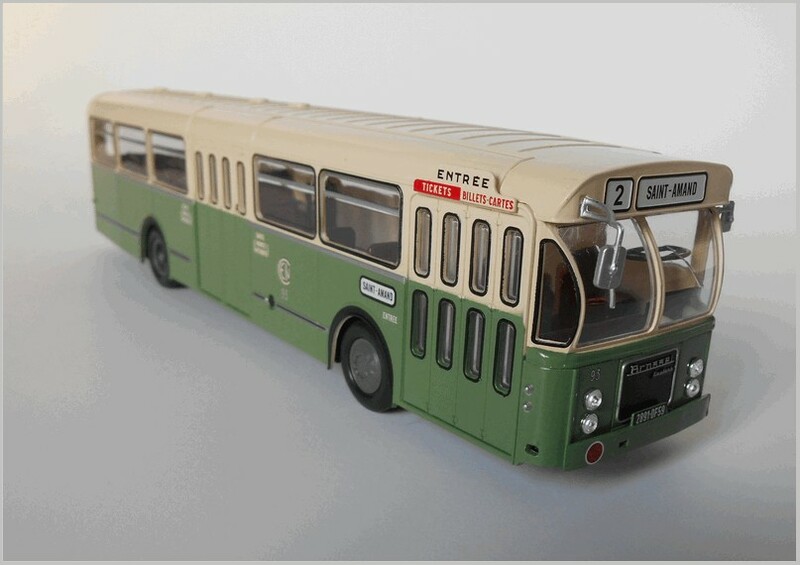 The A92 DARL fully respected the specifications of the Compagnie Générale Industrielle de Transports (CGIT) of Lille: a modern 100-seater urban vehicle with one man operation. The body was from Jonckheere, a coachbuilder founded in 1881 and still active today after a fusion with the VDL group. In 1966 an improved version of the A92 DARL was produced, called BL55 : the differences were limited to the spherical cylindrical windshield (already seen on the last A92 produced), the transmission system was now based on a Voith-Diwabus electric gearbox and the Leyland engine now delivered 135 CV. The BL55 was well received by many municipalities, especially its high roof version, and soon it could be also found in Liège, Charleroi, Arles, Brest, Nice and Montpellier. But the BL55 was never replaced as in 1968 Brossel was bought by British Leyland and its name disappeared the following year. 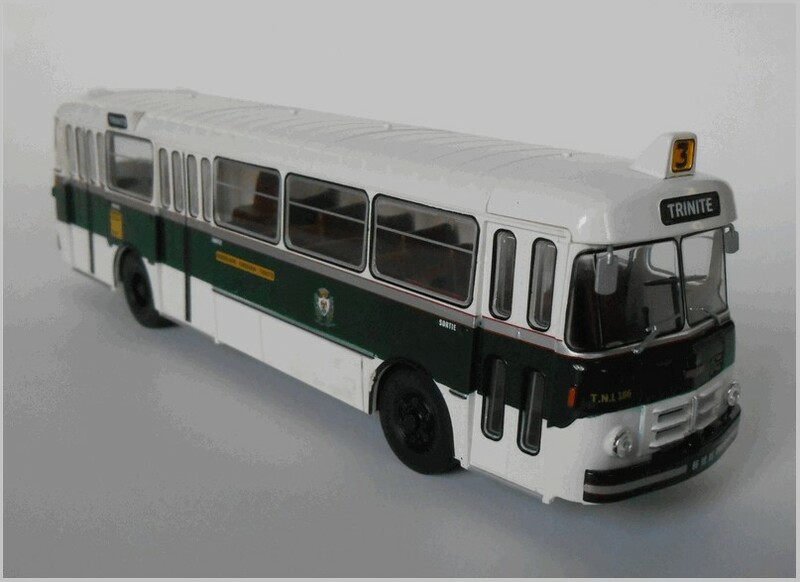 Like the real bus the scale model has very few differences when compared to the previous A92 DARL. The shape of the windshield is now a spherical cylinder, and the front and rear sides are slightly modified. Very likely the plastic body’s mould is partly re-used from the A92 DARL. 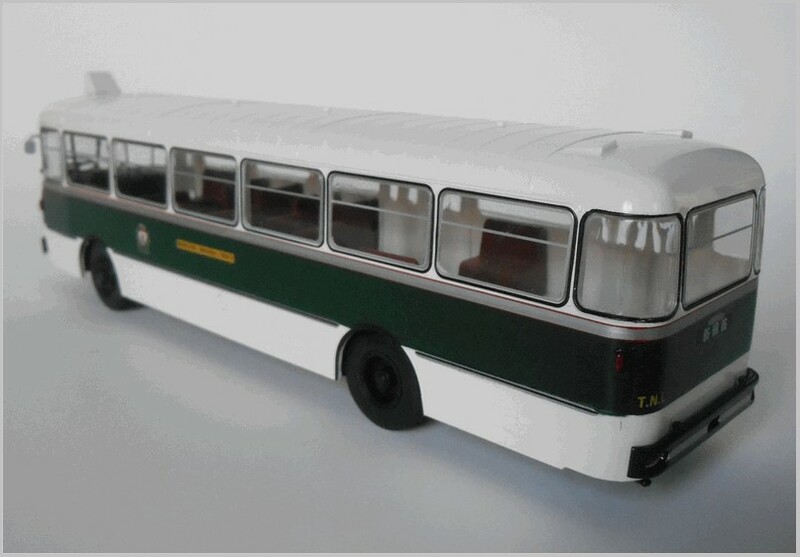 At the front a new panel with a grille is fitted and “Leyland” has replaced “Jonckheere”, whist at the rear a new pattern of rear lights are fitted. 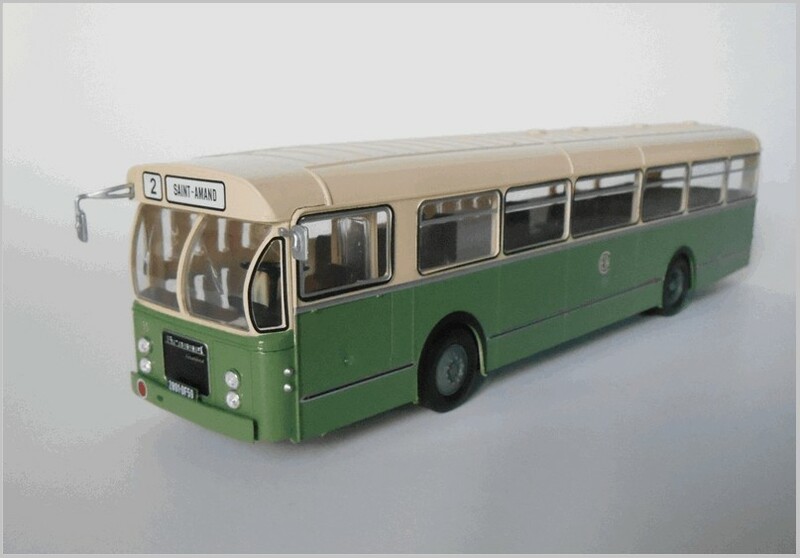 The livery is the usual olive green and cream, the metal baseplate has been modified and the new version name printed. Usual small plastic parts have been added: lights, mirrors, bumpers, etc. However, the wipers are now engraved on the windshield. The bus is from the town of Valenciennes, in the Nord department in northern France, about 50 km from Lille, and sports the CEN (Compagnie des Chemins de fer économiques du Nord) logo. The automotive industry was a key source of support for the local transport services, both Peugeot Citroën (PSA) and Toyota have manufacturing plants in the area. The destination board reads “Saint Amand”, a city located about 10 km north-west of Valenciennes, almost in the heart of the Scarpe-Scheldt regional Natural Park. The registration plate is from Lille. As usual the red spot designates a regular scheduled service. There are no apparent differences to the French edition. 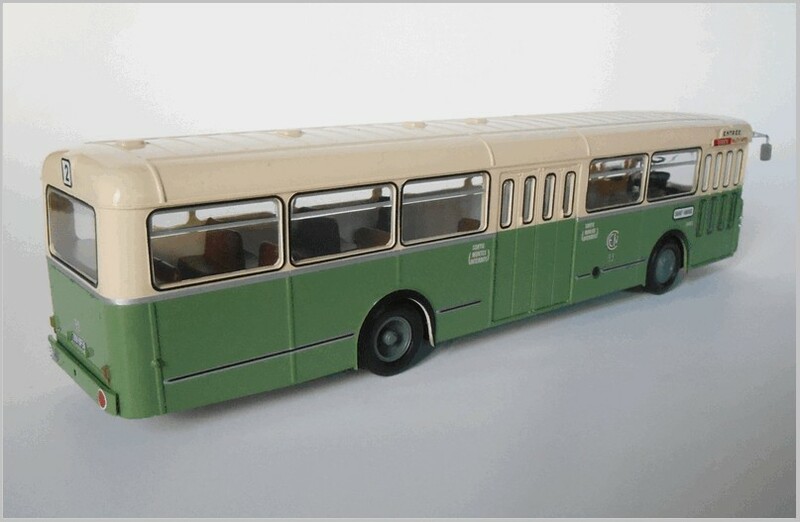 A fair reproduction of a bus well known in northern France. L10000 truck, modified for use as a passenger vehicle. All chassis had three axles, with single wheels, better for handling and a relatively high speed (max 75 km/h). The bus had lower side rails lowered and a longer rear overhang making it up to twelve metres in length. When production began in 1937 the engine was a 12.5 litre diesel straight six, but as early as 1938 it was replaced by a “fast” 11.2 litre one. The body was by Kassbohrer, better known as Setra after the war. This bus was designed mainly for long distance routes. 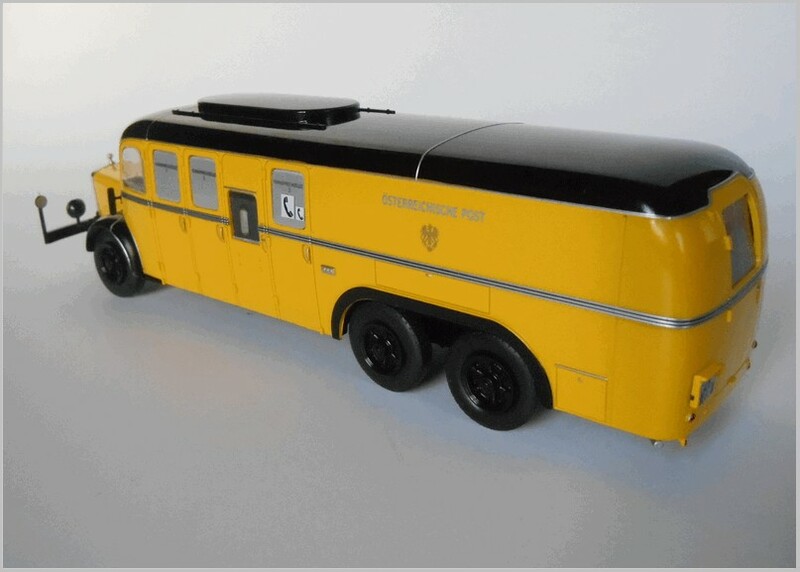 It was seriously handicapped by both its length and its high fuel consumption, and a total of less than 400 units was produced, of which 160 ordered by the Reichpost, to use for its mixed postal and passenger services on the new “autobahns”. After the Second World War some of them were sold to the Postamt, the new Austrian Postal service, to be used for mail sorting whilst en-route and to carry out subsequent distribution. 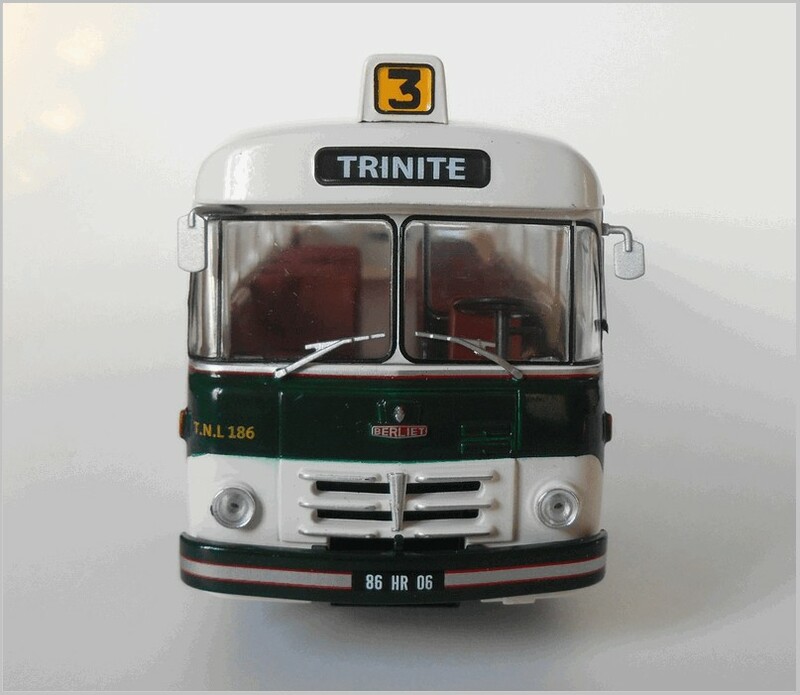 Like the previous red and black passenger bus model, the miniature is really imposing with the protruding nose adding to the impression of brute power. The model consists of a plastic body and metal chassis as usual, with many added plastic parts. Hachette operated a very smart ‘recycling’ operation, using the chassis and some parts of the previous model and adding a new body to create a new model. 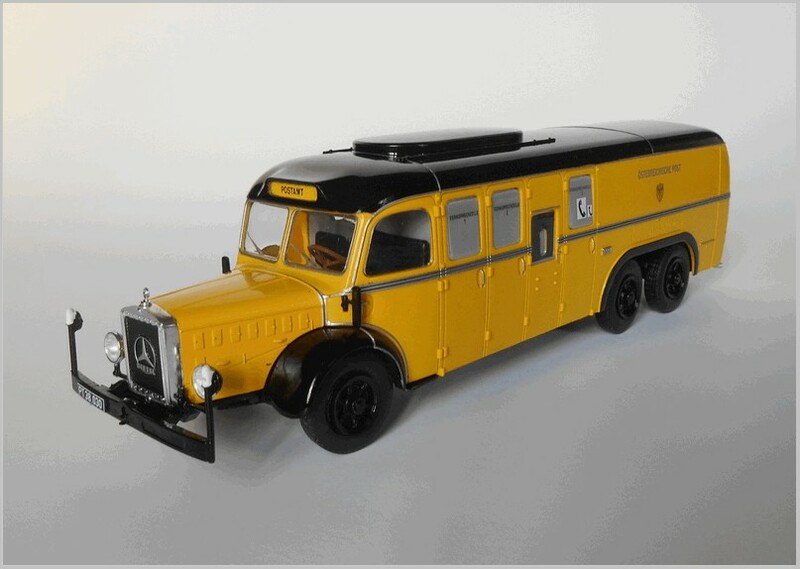 It is indeed a faithful reproduction of a real post bus that served the Austrian Postal Service as a parcel truck after the Second World War, plying the Salzburg-Vienna route. Later on it was converted into a mobile post office which was used at events like the Salzburg Festival or as a temporary post office. 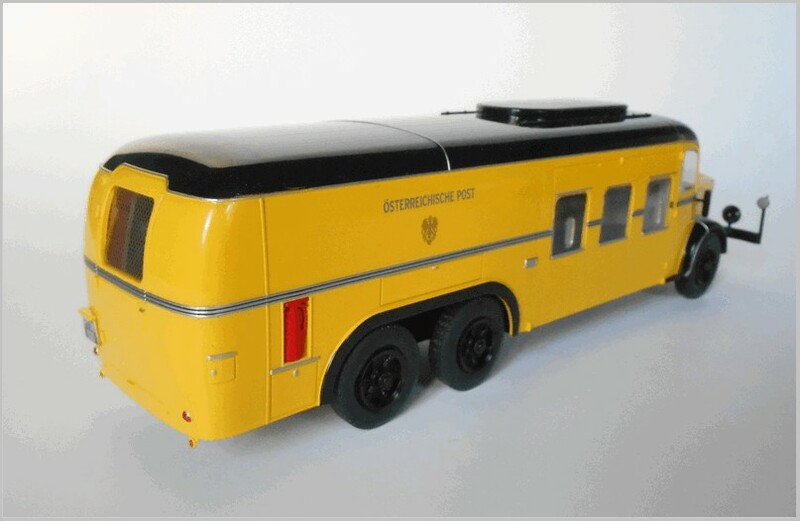 Saved from scrapping, it was restored in 1987 and exhibited in the Mercedes Benz Museum (see https://www.mercedes-benz.com/en/mercedes-benz/classic/museum/mercedes-benz-o-10000-mobile-post-office/). There is a very nice little fire extinguisher on the right side, but the interior is quite difficult to appreciate, due to the small dimension of the side windows. On the left side there are three “fernsprechzelle”, phone booths. There are no apparent differences to the French edition. 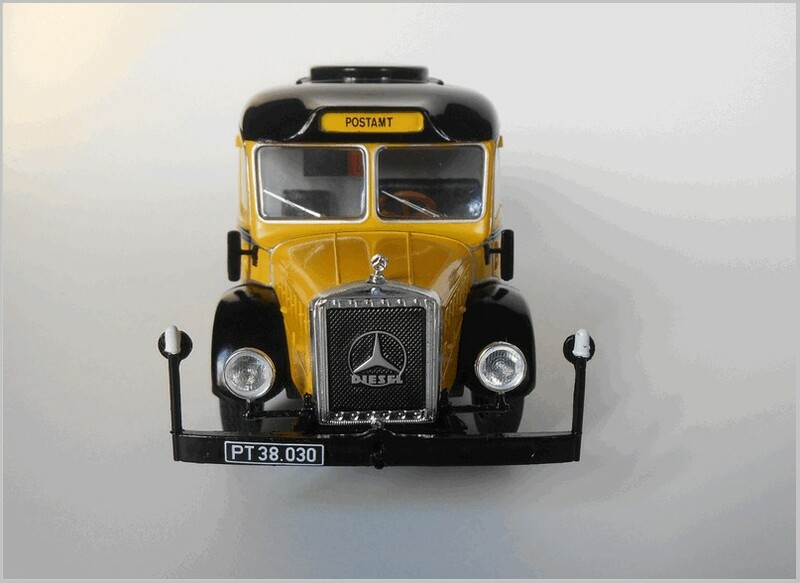 Thanks to Hachette for a nice reproduction of an emblematic version of this rare German bus. No. 69 (no. 92 in the French collection) Berliet PLR 8 MU 1956 – Another Berliet, but on the other hand we must remember that it is basically a collection of French origins. After the Crusair 3 (see part 8, no. 22), the PHL 10 (see part 10, no. 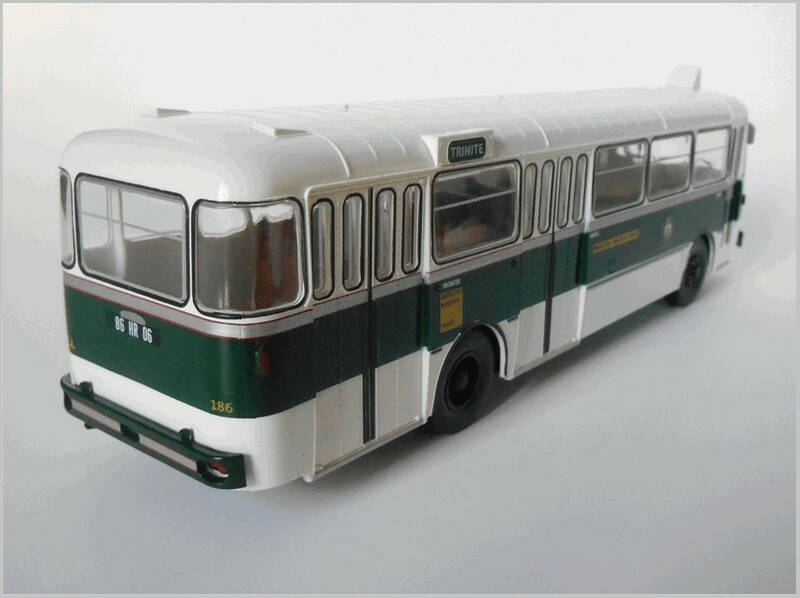 30), the PR100 range (Jelcz version, see part 14, no. 40), the PLR 10 (see part sixteen, no. 47) and the original 1969 Crusair (see part twenty one, no. 62), it is now time to go back to the PLR 8 MU. As you’ll remember Berliet was one of the first automobile makers, and was part of Citroën from 1967, and was then acquired by Renault in 1974 and merged with Saviem into the new RVI in 1978. After the Second World War only commercial vehicle production was resumed, and Berliet had to Face intense competition from Chausson and Renault both of whom had a new self supporting bodies. Indeed Berliet didn’t had any experience outside the field of heavy commercial vehicles, and choose to buy the whole company and know-how of Rochet-Schneider. 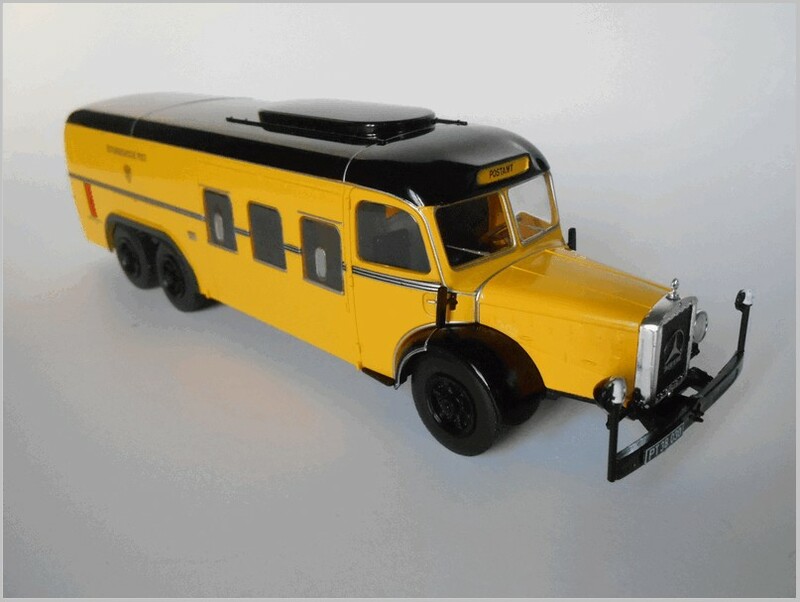 In 1951 it launched the PLR 8, a very powerful bus, but already out of date: its heavy welded box frame, its dual rear wheels and horizontal engine meant high costs, both to buy, to operate and to maintain. The PLR 8, a 90-seater urban bus, was equipped with a 125CV five cylinder horizontal MDUH diesel engine fitted slightly on the right side of the vehicle, while the PLR 10, an intercity bus, had a 150CV six cylinder MDZH diesel, which was later also used on the urban version. Produced from 1952 to 1963, this vehicle was the first model of the brand equipped with a horizontal motor under floor. In 1958 a new generation of very low consumption engines was developed thanks to the MAN injection system, called “Magic” by Berliet. But this evolution did not save the bus from its fate, and it missed the commercial success it deserved. 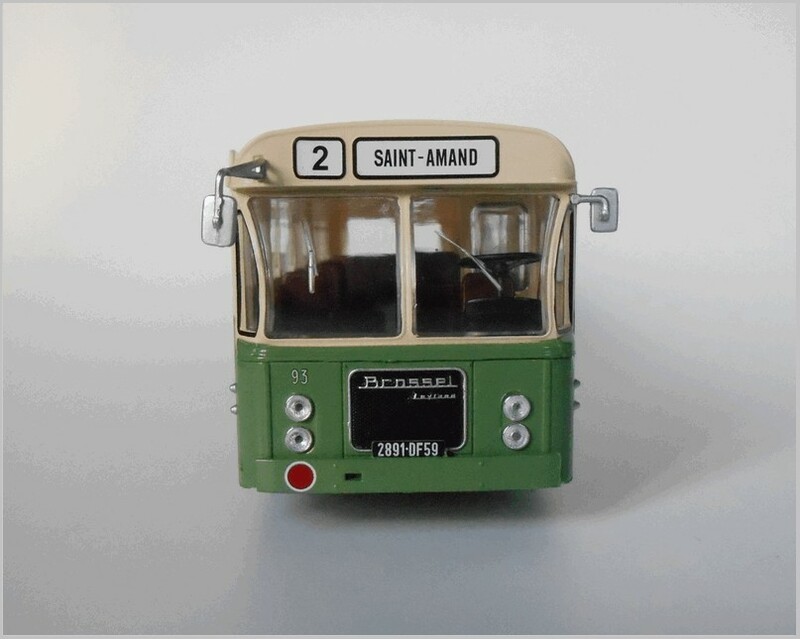 The scale model represents an urban bus from Nice, department of Alpes Maritimes, in the south of France. The destination board reads “Trinité”, a town a few kilometers from the center of Nice and reached by climbing the first hills that surround the city,. Within is located the sanctuary of Notre Dame de Laghet, whose Baroque church, a famous destination for pilgrimages, dates back to 1656. The model has a plastic body, very likely derived from no. 47 and slightly modified, and a metal baseplate. The plate is still engraved “PLR 10”. 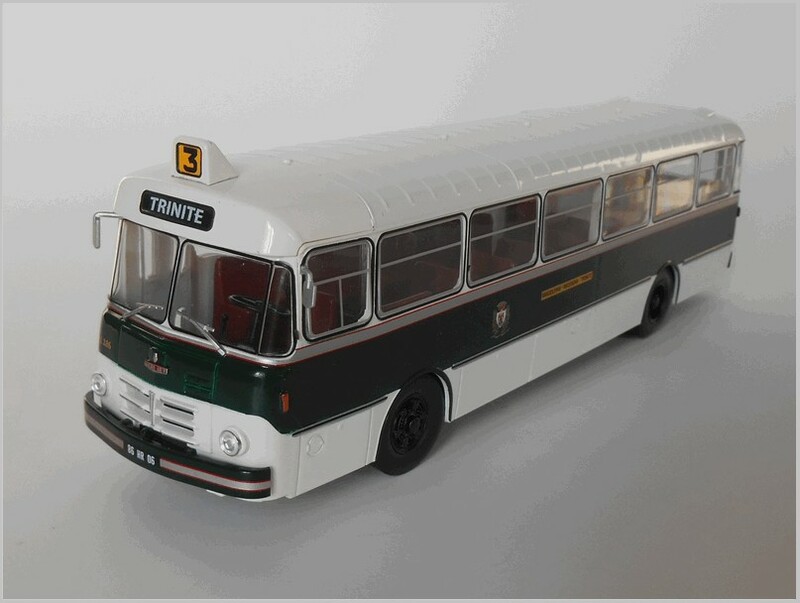 Dark green and white livery, with the Nice crest on the sides, together with the route board “Madeleine Massena Trinité”. A very nice front grille is fitted, suitably pierced. Good wheels are fitted. A neatly reproduced driver’s cab area is included though the rest of the interior is basic. It is at least different internally to the PLR 10. There are the usual added parts like lights, bumpers, mirrors and wipers. Again there is no apparent difference to the French edition. A bit disappointing, the livery is the only significant change.